The ceramic-reinforced inflatable lining solution ideal for high wear applications. VibraCube® is an innovative, wear-resistant solution that solves the problems of mining equipment blockage caused by abrasive, sticky, fine, and cohesive materials. VibraCube® is particularly effective in severe, high wear applications. VibraCube is a patented, ceramic-reinforced inflatable lining system that is designed to eliminate material buildup in applications with severe material flow issues, abrasion, and impact. These liners work by periodically inflating and vibrating to break loose sticky material building up on the surface. VibraCube’s powerful composition provides extreme wear, abrasion, and impact resistance while optimizing material flow in a variety of transfer applications. For the past 3 decades, our inflatable technology has saved our customers tens of millions of dollars in production and maintenance costs. Comprising our proprietary high tensile strength molybdenum rubber complexes, our Dynamic Inflatables are custom-designed and account for every aspect of the application for optimal performance. VibraCube is reinforced with our superior alumina ceramic cubes. 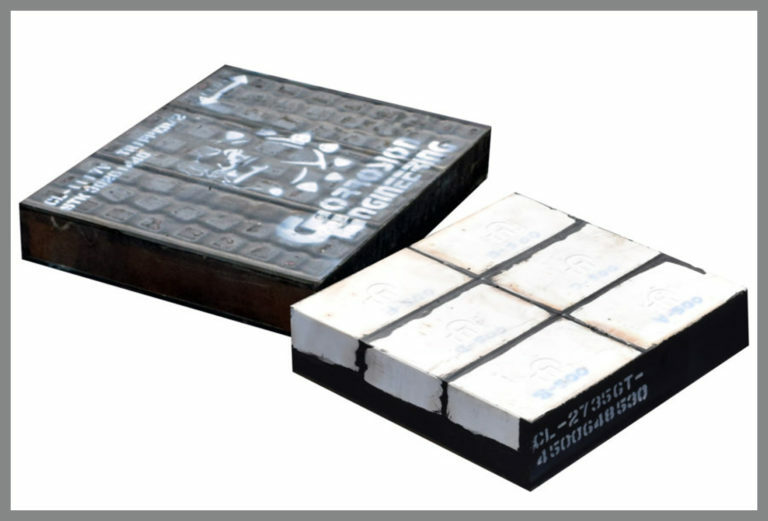 Our proprietary ceramic cubes have a geometry that is extremely effective for resistance against high-pressure, large particles, severe impact, and abrasive environments. Our superior ceramics offer up to 30 times the strength, abrasion, and chemical resistance of other wear materials, such as wear-resistant steel. Unlike low-friction non-metallic alternatives, Corrosion Engineering inflatable linings feature high performance abrasion resistant rubber to minimize wear and extend equipment and process availability. In addition to eliminating build-up, our dynamic inflatables are easily controlled by our state-of-the-art control systems. Our state-of-the-art control system delivers air at the proper pressure and volume while providing high-frequency pressure pulses to dislodge sticky, cohesive materials effectively. For multiple liners running simultaneously, each liner can be given its own unique configuration, with customized pulse frequency, cycle time, on-time, and off-time. Corrosion Engineering’s inflatable lining systems are offered with a customized automated control system featuring a programmable logic controller for easy and accurate automation of each individual liner. Control terminals are provided to permit connection of the control system to the main plant control and monitoring system, if desired. Ideal applications for VibraCube include Conveyor transfer chutes, Vibrating pan feeders, Feed & discharge chutes, Crusher collection chutes, Gyratory pockets, Grizzly undersize chutes, Apron feeder dribble chutes, Haul trucks, Vibrating stockpile feeders, Dribble walls, and more. Corrosion Engineering’s top-performing lining systems for chutes and boxes increase material flow in high-capacity operations, eradicate buildup issues, increase service life, and improve safety.